We shoved off the dock that morning last September, my wife Amy and I, with our confidence already low. The mighty Mississippi was running especially mighty and carrying so much sediment that it seemed prime for catfish noodling, not musky fishing. As we ran upstream, I realized that the low-odds muddy river presented an opportunity to try something I’d been thinking about. I had an old 12-foot 7-weight switch rod stashed in the boat for just such a day. The theory was this: In some ways, musky fishing is similar to swinging flies for sea-run fish on big western rivers. Both pursuits involve casting ad infinitum, maybe with days or weeks between fish, and accumulative mental and physical fatigue. What might the mature traditions of the Western swingers be able to teach the fly-rod musky hunter? Easy: two hands are better than one. After a little practice, the switch rod (paired with my everyday 450-grain musky line) was soon launching some of my larger flies with ease. No, I wasn’t casting into the backing, or even really getting any more distance than I had been with my single-hand rod, but I was false casting half as much, and my right arm was doing less than half the work. Then a musky ate my fly. She came from a frothy latte-colored seam at the top of a fast run and inhaled the fly right at the rod tip. I immediately discovered the weakness of that switch rod: close-quarters battle. With the rod noodling, this CQB-specialist musky shot under the boat into the heavy current, gaining 40 yards of line while I tried to not break the rod on the gunwale. With all that line out, the tide turned: I bent the rod deep and easily pulled her out of the heavy water and back boatside, where I was again wishing for my 9-foot broomstick. Thanks to good net work from Amy, we landed that fish — a respectable 42” Minnesota river musky — but it had been a close call. The advantage of the two-hander was obvious. Casting giant flies all day is tough stuff — not just for neophyte anglers, but also for those of us that are feeling the effects of all the dues-paying, like worrying tendonitis in arm, wrist, or elbow. With the switch rod, I was using the big muscles of both arms and both shoulders, fishing longer, and feeling none of the normal joint strain. I could see this extending my musky-fishing day, season, and career. There was still, however, the issue of handling an angry fish right by the boat with a 12-foot noodle. I suspected that a shorter, stiffer switch rod might help with that problem, and more testing was needed. I had another musky trip planned with my bud Dave Karczynski, so I scrounged a few different demo switch rods, and we worked them hard in the Wisconsin backcountry for a week. And work they did. Here’s what we learned. The sweet spot seems to be switch rods in the 11-foot, 8- or 9-weight range. We tested four. The Sage X 11’ 8wt was the smoothest and the most fun to cast with all but our biggest, heaviest flies. Next was the Orvis Helios 2 11’ 9wt — this one was the cannon of the bunch. We never found the H2’s fly-size ceiling. However, its fast action was less forgiving and demanded good casting technique. We also brought the Redington Chromer 11’6” 8wt and the Orvis Clearwater 11’ 8wt. Both are softer overall, and more forgiving of beginner casting and late-in-the-day timing degradation — but that softness means you’ll be fishing your smaller flies, and it did prove to be a liability when fighting strong fish right next to the boat (but still not as risky as that 12’ 7wt). The 9wt H2 and the 8wt X, however, proved very capable of fighting fish effectively. One of the golden rules of musky fighting is to never give the fish an inch if you can help it, and that’s very doable with an 11-foot rod. Just don’t be afraid to put a bend in it, and plan where the net-handler needs to be ahead of time. For example, where possible, take another page out of the steelheaders’ book and hop out of the boat to net the fish. Take smallmouth and pike bycatch opportunities to practice the fighting-netting-landing procedure instead of flying by the seat of your waders when you’re suddenly tethered to a four-foot muskrat muncher. 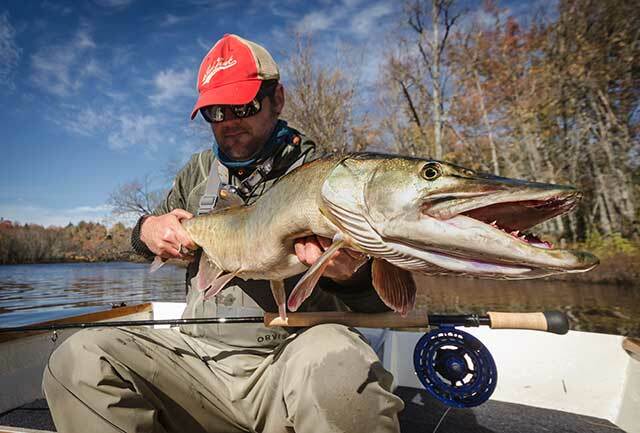 What about the extended-cork 9-foot rods that are on the musky market these days? 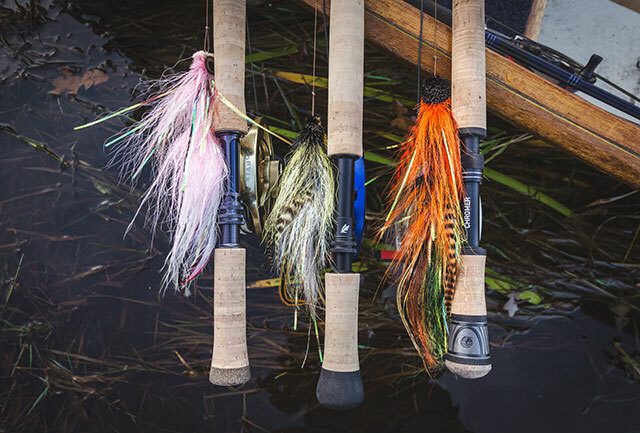 The Orvis Helios 2 Big Game, the TFO Esox, and the G. Loomis Pro-4X Long Handle Predator are all two-hand castable, though they’re much stiffer than a true switch, and the maneuver feels a little bit field-expedient. Also, with a shorter rod shifted into both hands, that dual-6/0 fly is rocketing past awfully close to your body. Add a little wind to the equation and you’re in the danger zone real fast. Luckily, the musky line you already have will work. I started with the Scientific Anglers Sonar Sink Cold 25 450gr, which is my go-to. We also tested the RIO Outbound Short WF10S/I 425gr type 6 and the Orvis Hydros HD Depth Charge in 450gr. All three lines did the job — they’re very similar — but the differences are worth noting. The Outbound Short and its “In-Touch” no-stretch core gets a nod for increased stripset confidence. However, the extra mass of the 450gr Sonar Sink and the Depth Charge really helped carry the largest flies. Lastly, the Depth Charge’s thick, textured running line was the easiest to manage on cold mornings with gloved hands. We also tried the Scientific Anglers Sonar Titan Intermediate in 11wt. It worked for smaller flies, and would be great for topwater work, but for the biggest articulated flies, you’ll probably want to move up to a 12wt Titan — or just stick with the full-sink lines. Lastly, we tried using a more traditional Skagit arrangement, the RIO Switch Chucker, and while it carried the flies okay, even with the heaviest sink tip it wasn’t putting them down in the kill zone, and all the loop-to-loop connections and the skinny running line made retrieving the fly a pain. Keep the reel centered in front of your torso and pinch the line above and below the reel with a couple fingers from each hand. 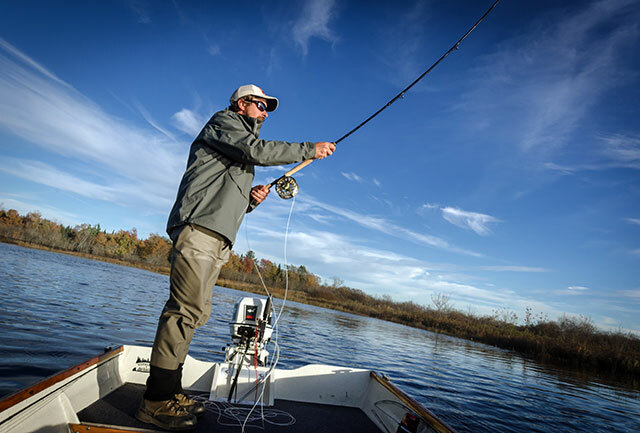 Start with at least a dozen feet of line out of the rod tip (use a mini-water load at the end of your figure-eight), and take it easy, letting the rod do the work. Right away you’ll feel how little muscle power you need to push-pull each casting stroke. Your loops should be soft and open, and you’ll need only one or two false casts. 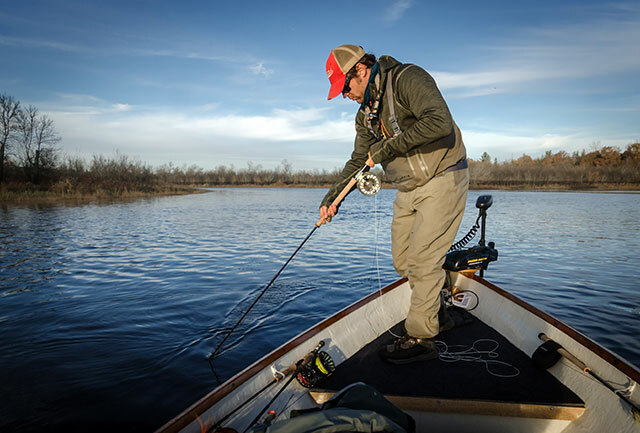 Once the fly, head, and a comfortable amount of running line are airborne, launch it all with a final hearty bottom-hand pull. Bonus: once you’ve mastered strong-side two-handed casting, it’s pretty easy to swap hand positions and cast over your opposite shoulder. No more on-shoulder wind or backhand casting. On the retrieve, grasp the cork way up at the top, and rest the reel between your elbow and your body. This will relieve your forearm and encourage good strip-set technique, which is extra-critical with the long rod. Lastly, you haven’t figure-eighted until you’ve figure-eighted with an 11-foot rod. It feels like cheating. Muskies tend to lose interest on figure eights when the fly turns sharply out of their field of view, which happens because you’ve run out of reach. With the switch rod, you can go wide and/or deep, keeping the turns round and the fly swimming. If you get an eat on the eight, stripset if you can, but if you can’t, go ahead and risk that rod in a deep, sweeping set in the opposite direction of the beast’s travel, and pray that your hooks are sharp.